A pioneering digital platform that supports GPs in detecting the early signs of cancer is to be rolled out across the north of England. Vanguard Innovation project Gateway-C has proved so successful that 73 per cent of GP surgeries in Greater Manchester and Eastern Cheshire – where it was developed – have already enrolled on its courses. Health Education England (HEE), which is responsible for the education and training of NHS staff, is funding a rollout programme to extend it across the rest of the region. The team behind the system will now deliver it to the seven cancer alliances in the North of England. These are partnerships that bring together clinical leaders from across the cancer pathway in a specific locality to improve patient outcomes. Gateway-C was developed by Greater Manchester Cancer Vanguard Innovation, which is part of the national Cancer Vanguard. Early detection is a key feature of NHS England’s national cancer strategy. Dr Catherine Heaven, who leads the Gateway-C project and is Associate Director of the School of Oncology at The Christie NHS Foundation Trust in Manchester, said: ‘We’re delighted to be given the go-ahead by HEE because it’s an endorsement of all the hard work our team has put into the project. ‘We’ve long acknowledged in Greater Manchester that our rates of early diagnosis must improve, and Gateway-C goes some way to achieving that. In Greater Manchester, almost 28 per cent of those patients with cancer are diagnosed in A&E departments which means that a high proportion have advanced disease when diagnosed. Greater Manchester has the second highest level of cancers diagnosed at a late stage in England, and almost half of all lung cancer patients are diagnosed at stage IV. Gateway-C is designed to support GPs in building a better rapport with their patients, encouraging them to disclose symptoms, and so become more confident in making decisions about referrals. The School of Oncology at The Christie developed Gateway-C’s courses which feature interactive films, based on real consultations, and other resources about cancer risk, symptoms, decision-making and education. 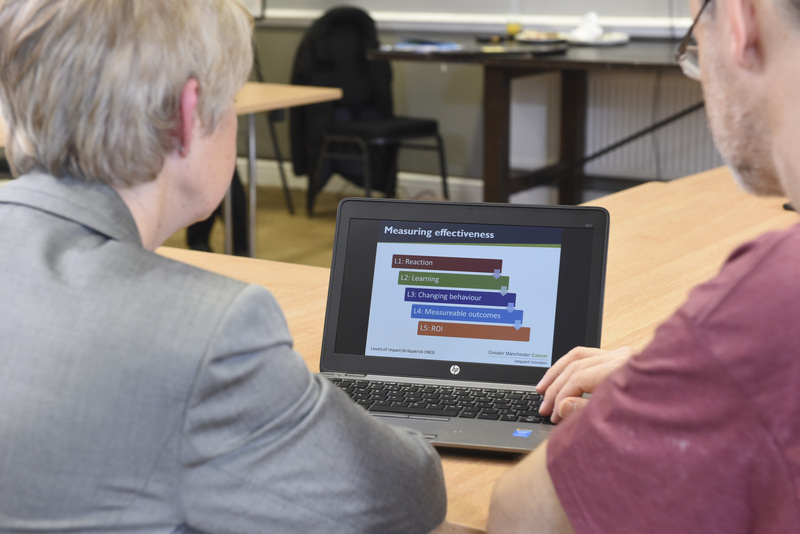 Primary care staff in Greater Manchester and Eastern Cheshire can access the learning zone – which is accredited by the Royal College of GPs – to take courses that support the early diagnosis of lung, colorectal and pancreatic cancer. GPs in Camden and Islington, in London, have also trialled courses with support from Cancer Vanguard partners at UCLH Cancer Collaborative. The aim is to roll out Gateway-C to more primary care staff in London and elsewhere. Cancer Research UK, Greater Manchester Strategic Clinical Network and Macmillan Cancer Support have also contributed to the development of Gateway-C which aims to be the pre-eminent educational resource of its kind.